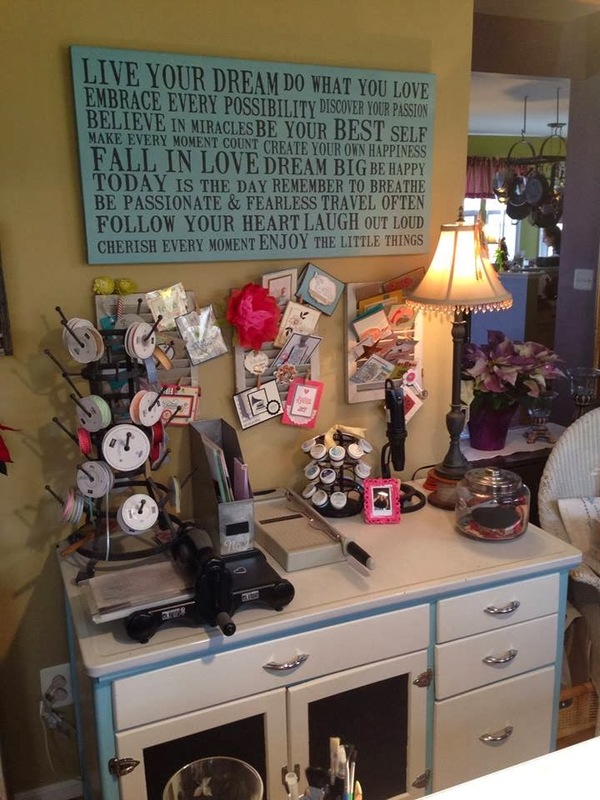 It's time for another installment of Simply Stampin' Up! 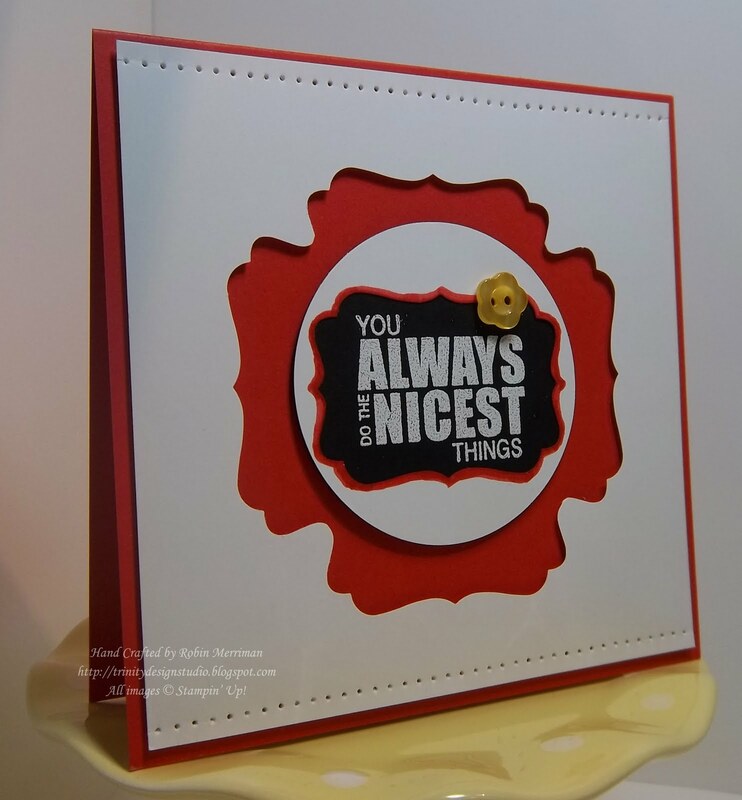 This week I chose a very contemporary card from a paper crafting magazine to re-do for you in all Stampin' Up! supplies. 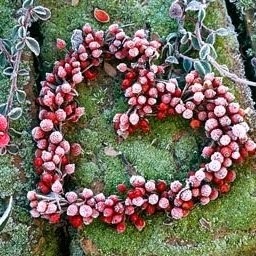 Want to see what to do to make it? Ok! Let's get started! Layer 1: My card base is a piece of Poppy Parade cardstock cut at 5" x 10" and folded in half to make a 5 1/2" square card. Layer 2: I used Whisper White cardstock for both the "frame" and the center circle. Let's talk about the "frame" first. To make the "frame", I cut a Whisper White square piece of cardstock at 4 3/4". I left a little more Poppy Parade edge showing around the outside of the white than in the magazine card, but I liked this better and since it's my card, I went with it! Taking my Decorative Label Punch, I centered it on each of the four sides, lining up each punched hole with the other as I went around the cardstock. ** TD Tip: If you center the first punch out correctly, then it's very easy to line up the next one as you go around the other sides. The rows of holes at the top and bottom of the frame were made with my Paper Piercer and Mat Pack. I used the template from the Mat Pack on the smallest holes and simply lined them up all across the cardstock, punching with my Paper Piercer all along. 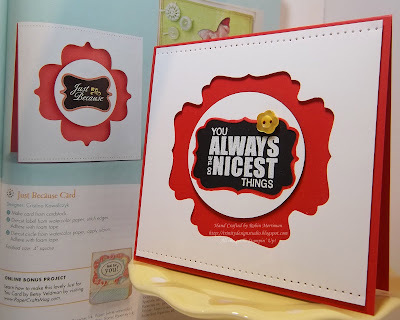 To make the center circle, I took a piece of Whisper White cardstock and punched it once with my Decorative Label Punch, taking care to leave enough room around the outside of the punched area to next punch that out with my 2 1/2" Circle Punch. I then punched out another 2 1/2" Circle from Basic Black cardstock. Taking my Poppy Parade Stampin' Write Marker, I very carefully colored a line all around the inside of the negative space that the Decorative Label Punch left. This created the inner frame for the greeting. I then adhered the punched and colored Whisper White circle to the Basic Black one. The magazine card used a rub-on for their greeting, which I didn't have. So to do mine, I inked up the sentiment stamp from the Happy Greetings stamp set that's in the Summer Mini Catalog with Whisper White Craft ink. Since I used a clear mount stamp set, I was able to see through the block to line my greeting up straight. 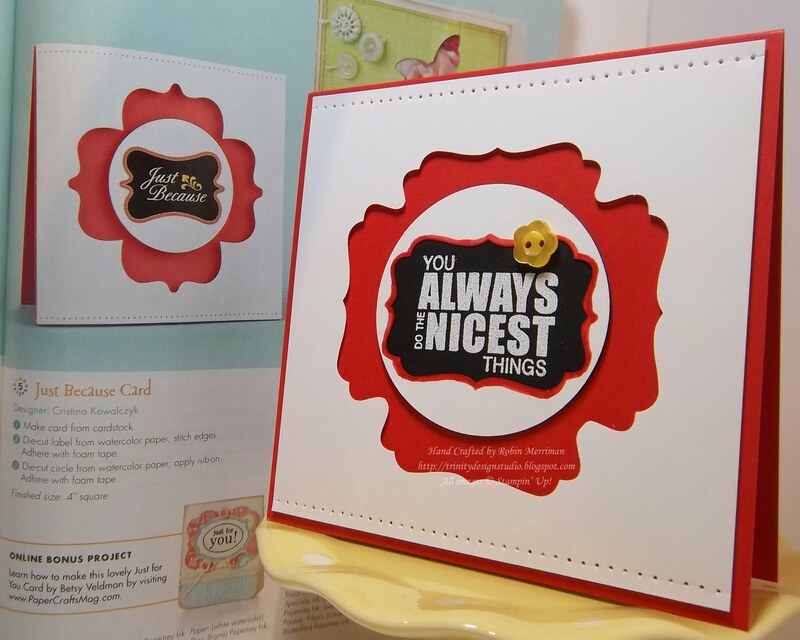 Once stamped, it was then heat embossed with White Embossing Powder and my Heat Tool. 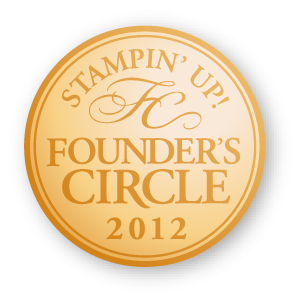 **TD Tip: To speed up your embossing time, take a piece of cardboard and cover it with aluminum foil. Lay your cardstock to be embossed on the covered cardboard to actually heat it. The aluminum foil reflects the heat back up through the cardstock and not only helps emboss it evenly, it takes less time to complete! I keep a similar piece of covered cardboard right next to my workspace at the counter so I can pull it out right when I need it. Ok, now that the embossing was done, it was time to assemble. I first attached the "frame" piece of cardstock to the card base. I used 10 Stampin' Dimensionals for this; 2 in each corner, and 2 on the right and left sides. Next, I adhered the stamped circles to the center of the card, using the points of the "frame" as my centering guide. 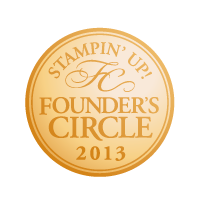 The circle was adhered with 4 Stampin' Dimensionals. As a last touch, and to mimic the magazine card, I added a Daffodil Delight button from the Brights collection with a Mini Glue Dot. This card was a lot of fun to put together - and it challenged me a bit too! I love a challenge! So, if you want to recreate this card or do one similar, I've put a handy supply list at the bottom of this post for you. 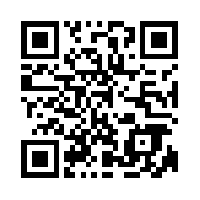 You can use it to shop in my Online Store for what you need at any time! Thanks for stopping by today - let me know what you think by leaving a comment, I love hearing from you! Ooooh! VERY cool! I LOVE how you used the Decorative Label Punch to make the frame. VERY inventive! OH I LOVE IT!!! I think I may have to try this out myself! I look forward to this ever week. This one is fabulous. Ok, could you PLEASE give a tutorial for the frame? I cannot figure it out! Awesome! Thanks for the directions. Wow, this is very cool - thanks for sharing the punch technique. The decorative label punch is my all-time favorite punch to use.